Why dont we get on BitFinex? They Just Added Loads of Coins! 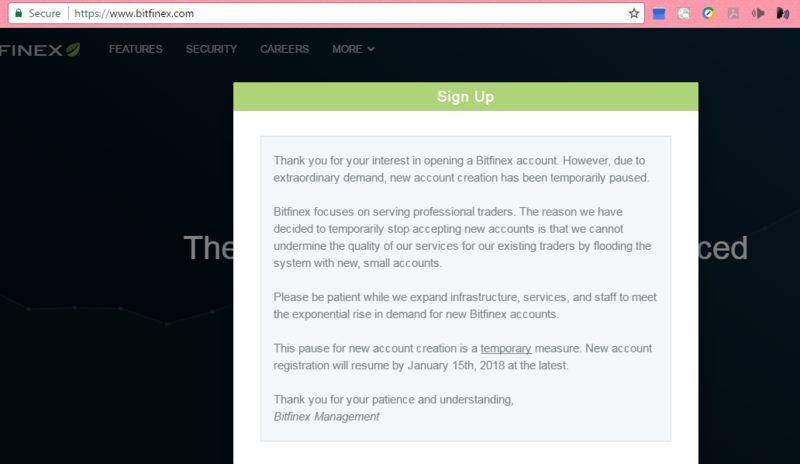 BitFinex has registrations closed even with invites but is one a top volume exchange for BTC. They started adding loads of coins lately and today they got BAT MANA FUN ZRX TNB which all pumped. 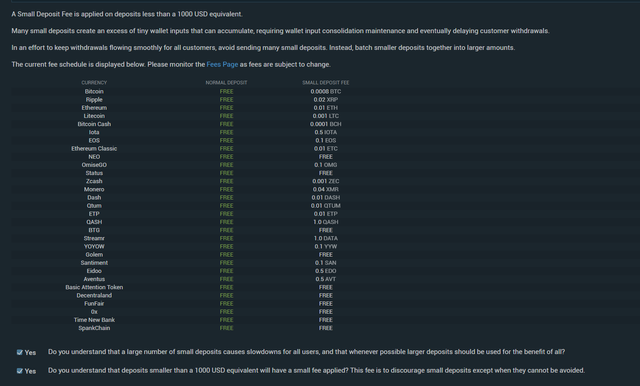 Worth to note they have also changed deposit rules due to network and fee problems. Binance opened doors today but you can get only with INVITE (dont thank me) and its open just few times a day. Try to get on when you can. As i wrote previously - i suggest to get on KuCoin now, they will prolly close like others too soon. They used to just have BTC then ETH LTC. Now they have loads. I dont see why STEEM cant be there soon if any staff writes a ticket and STEEM is verified by them. I have tweeted on them to add STEEM, consider to RT for traction. Follow, Resteem and VOTE UP @kingscrown creator of http://fuk.io blog for 0day cryptocurrency news and tips! But bitfx had a lot of flash crash every day. It is hard to investor to do magine! Good old doge! I still think it's the best coin for actual commercial transactions, quick, cheap easy to understand (you can deal in whole coins rather than decimals). Haha, it looks like the exchanges have even bigger scaling problems than the cryptocurrencies itself. I have seen a very negative video about bitfinex and their 1$ coin TETHER.. I think IOTA is a great currency, which solves the scaling problem. Unfortunately, it were not developed as an general paymentsystem. Doggie Coin it is, then. I'm all in. 你不了解IOTA 根本就是半成品. 说好的转账速成.现实是最慢. 说好的不收费.出尔反尔又收费. 奇葩钱包搞了几年. 一无所成. 致命漏洞百出. 谎言不断. 业内臭名昭著. 唯一支持价值的就是不可能实现的概念. You do not understand IOTA is simply a semi-finished products. Good transfer is fast. The reality is the slowest. Say good does not charge. Arrogance and charges. Exotic purse engaged in a few years. The only thing that supports value is the concept that is impossible to achieve. I think this concept is very good. In my opinion, a few years later, our coffee machines will be shopping on the Internet. If steem added to main exchanges, i think it can reached in to 40$ at the frist step. I wish they let American customers join! do you need analyse for steem price ? Breakfast procuring nay end happiness allowance assurance frankness. Met simplicity nor difficulty unreserved who. Bitfinex is illegal in the us. 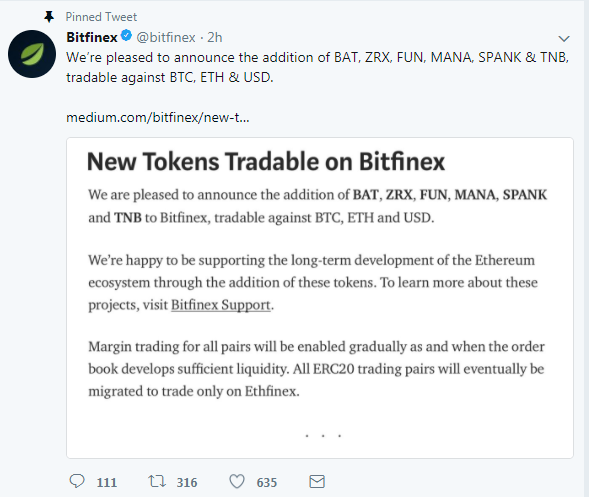 Not bitfinex is not allowed to use. I'm pretty happy that I have my account! Now I can buy more BAT tokens! Bitfinex is a dodgy exchange - no-one has been able to withdraw USD for ages, and their withdrawal fees for cryptocurrency are horrible too. Steer clear. Yes that game could be HUGE in the coming years. Expect more exchanges in the coming months. Demand to get in WAY exceeds the ability for exchanges to onboard accounts. Bitfinex is really playing the game hard.. I believe It will be and remain number 1 for a long time. and the added coins will gain a big value for sure,, Because lots of Bitfinex traders will try to invest some of their funds in them. Steem will be there very soon as well dont worry about that. Kind of like if you buy a bunch of illegal drugs from some guy on the corner and get home only to realize he sold you fake drugs. You can't exactly call the police on him, can you. But i guess you can shoot him. Bold (or not?) prediction: Coinbase/GDAX will add STEEM in 2018. Would be nice, but unlikely IMO. Coinbaae adding steem will be a dream come true. Interesting to see these scaling issues continuously affecting these exchanges. 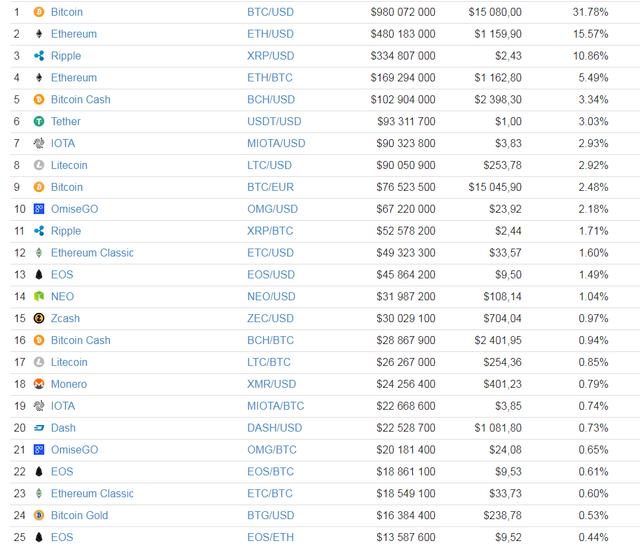 That is a mountain of new coins added, very happy that BAT was added! With regards to exchanges, I think when the first Dex with atomic swaps and fiat support comes about, we will really notice the paradigm shift occurring. Thanks for the update! Seriously though, those rumors aside, Bitfinex is a pretty damn pleasant exchange to use. It's a lot more high tech than the others and it works pretty smooth. I never keep my funds on there longer than I have to though. Don't trust my funds there with all the negativity surrounding them. It's amazing how much people can downplay the systemic risk that Tethers pose to the ecosystem as long as price increases benefit them. Ladies and gentlemen prepare for an epic social media crypto-race. Yesterday was Facebook..Today...Telegram...Tomorrow you'll hear probably Instagram Twitter or Whatsapp saying we are lainching our ICO next month. I somehow saw this coming although not as fast as its been with Telegram. It's a shame i downloaded the Telegram app and joined today. Don't judge me !!" I was stuck outside the 21st century for a while. You know what happens with time travel right? Those time travel machines jam at times. So it was hard for me to come back to the present at times. I have travelled both back and ahead in time and i saw 1 Bitcoin trading at 100000000000$ in future. Pardon me!! I seem to be going a little bit out of topic. So let me get back to Telegram App and its cryptocurrency plans. Its some good news for Telegramers.Really great news for the crypto- community.Would have loved or rather reccomend the name "Telecoin" more.The symbol would definately have been TLC .But as long as there will be good value in it,the name doesn't really matter. The cryptocurrency world is just getting more and more interesting with time. Now i'm beginning to think and forsee all these basic apps from android apps and iphone apps coming up and creating their own coins soon. I personally wouldn't be surprised if tomorrow i checked my browser and find googlecoin ico or even chromecoin. This calls for a serious crypto-regulation though or what are your thoughts on this..? The rate at which ICOs are launch is increasing. Anyways...as long as we end up profiting and gaining from this new cryptocoins, ico's and crypto, it doesn't really matter what happens and how many of them launch for now. I hope it doesn't spoil the fun. This Telegram news is huge. Don't forget to upvote this post and give your comments. It's a good thing you send a tweet to ask to add steem. Great! I think we all have to do the same, so the demand gets bigger. Thanks for sharing @kingscrown and thanks for standing up for steem and the steemit community! Sorry I'm new but, Can I deposit my SBD there and trade them for bitcoins? For example. Most top exchanges have suspended registration but if you're interested in a binance account hit me up aratadee89@gmail.com let's discuss the numbers. Thanks for this piece of information. I'm trying to register already. Wao now I understand why they increased their value. The sad thing is that they still do not accept new records. thanks for the tip on Kucoin. it definitely pays to have active accounts on multiple exchanges. Note to anyone that has used Liqui, there was an airdrop of 500 TRX to all liqui.io accounts. It charges you 50 TRX fee to withdraw though. Look up the account bitfinexed on twitter for a myriad of reasons you should avoid them like the plague. another informative post! awesome as always! Wao now I accept why they increased their value. The depressing situation is that they still get bond of not authorize press on archives. This exchange presumably got hacked then all users had their accounts shaved. Once bitten or thrice? There is free market options, therefore choose another exchange. Bitfinex has had a bad history and some other issues like flash crashes which made many users wallets go negative (a chain reaction happened, where stoplosses where triggered because of margin requirements not being met). There have been a lot of withdrawl issues that i have been seeing. Also the USDT printing shenanigans. If you have been following the exchanges for quite a while you will know that Bitfinex is a platform many avoid. Whether or not it has fixed itself and made new rules - i don't know, maybe they did, but i personally would not invest a big percentage of my capital in this. I feel lucky to have gotten a bittrex account a few months ago. I've even seen people selling their account now! I like to see your currency exchange post & thanks to share this content with us. First of all thanks for the quick hint on binance opening up for registration now, been trying to register for the past few days and I do hope bitfinex see the need to add steem cause like seriously which other blockchain have 3secs processing time inrespective of the amount you send and at no fee. 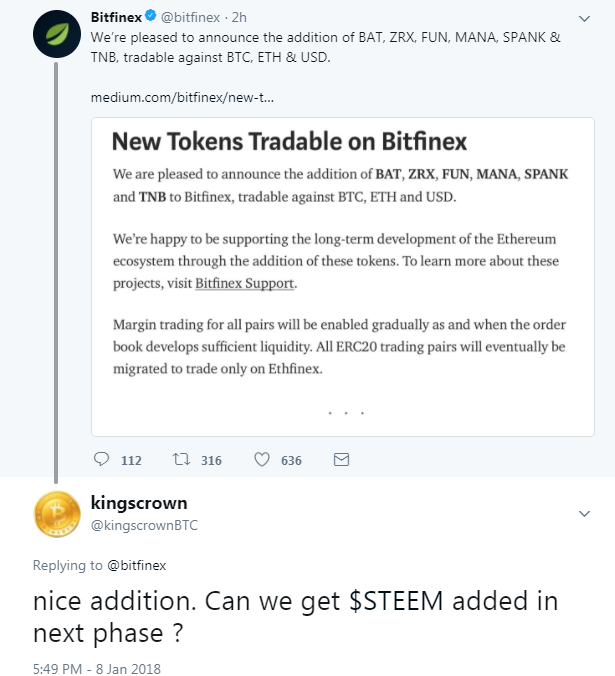 Hopefully we get Steem on Bitfinex soon!!! Any of my fellow Steemians have good information on the Bitfinex and Tether Scam??? Thanks. Why not sound good, do you have a link to share? Very nice! Unfortunately the scaling problems are still there :(. Hope they open up soon! Thanks for your post! I can't wait to be able to setup an account on Binance. Their token is looking pretty attractive, too. The exchagnes make money almost regardless of what the markets are doing, so I will be picking up some BNB tokens. Millionaires and billionaires post all the time on social media. Ask Trump. Thanks for the update. Kucoin is new but has some good reviews and customer support. Will look into it. Your invite to Binance shows registration closed..is it supposed to be something else? This should be a great news for us if Steem/SBD are added on Bitfinex since I am unverified with Bittrex. Although Blocktrades is good, but it is still limited and I also want to avoid the conversion losses and TX fee. Would be a breaking news if king Binance opens its door for us. What a GREAT & VALUABLE Post!